Since Commodore Geneviève Bernatchez’s appointment as Judge Advocate General on 27 June 2017, there appears to be early and welcome indications of winds of change within Canada’s military legal branch. 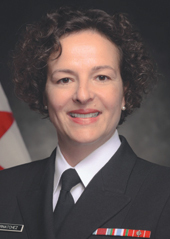 She has released the complete report of the Comprehensive Review of the Court Martial system (parts of which her predecessor intended to shield from public access behind solicitor-client privilege); on 25 January 2018, she issued a statement that the Canadian Forces National Investigation Service had laid charges against the Chief Military Judge, Colonel Mario Dutil; and provided answers to a very long and detailed list of questions submitted in preparation for this article (a turnaround of less than one week). FrontLine Defence magazine and our Atlantic Canada correspondent, Tim Dunne, wish to acknowledge and thank Commodore Bernatchez and her team for their openness and transparency in contributing to the debate about Canadian military justice. Commodore Geneviève Bernatchez, CD, Judge Advocate General of the Canadian Armed Forces. Photo: DND. On 25 January 2018, the defence department announced that the Canadian Forces National Investigation Service (NIS), the military’s version of a criminal investigation section, had laid several charges against Colonel Mario Dutil, Canada’s Chief Military Judge. With this announcement, the military’s legal branch faces an unprecedented situation, analogous to navigating in uncharted shoals at low tide. The Office of the Chief Military Judge is an independent unit of the Canadian Forces established in 1997. Its personnel include: military judges; the Court Martial Administrator and the Deputy Court Martial Administrator; military and civilian court reporters; and technical, financial, human resource and administrative support personnel. The Chief Military Judge has three subordinate judges at the rank of lieutenant colonel, one rank level below Colonel Dutil’s, calling into question how a subordinate military officer can sit in judgment of his or her boss. Military judges preside over courts martial, the judicial review of persons held in pre-trial custody, formal boards of inquiry and other military proceedings requiring a member of the military bench. The Canadian Armed Forces conducts two types of courts martial: A standing court martial has a military judge presiding alone, while a general court martial features a military judge and a panel of five military personnel who must unanimously determine guilt or acquittal. The type of court martial depends largely on the nature of the charges. Senior government officials are quick to point out that, as in the civilian justice system, no one in the Canadian military is above the law. All Canadian Armed Forces members, regardless of their rank or position, remain subject to the Code of Service Discipline, and all who are charged under Canadian military law are presumed innocent until proven guilty. While these charges against its Chief Military Judge create an unprecedented situation, there is nothing in the National Defence Act or the panoply of regulations of the Canadian Armed Forces that exempts military judges from being subject to the Code of Service Discipline (the part of the NDA that specifies the infractions that can be committed by individuals within the military’s legal jurisdiction). Colonel Dutil faces three charges: act of a fraudulent nature under NDA section 117(f); making a false entry in a document signed by him required for an official purpose under NDA section 125; and one count of conduct to the prejudice of good order and discipline under section 129 of the National Defence Act. Two charges are similar to charges found in the criminal code but the NIS decided to make the charges under the NDA. This provision of the National Defence Act incorporates all offenses that are found under federal statute into the Code of Service Discipline. However, NDA section 129 has no parallel in Canadian law outside the Canadian Armed Forces, a “Catch 22” if you will, formerly called “the Devil’s article” because of its broad sweep and ability to include any act or action that falls outside the narrow laneway of military acceptability. Enacted by Parliament, this provision ensures that military principals can prosecute any infraction or misconduct not specified elsewhere in the National Defence Act. Although typically more nuanced in practice, it basically gives a superior officer the capability to deal with any act or circumstance he or she feels constitutes a military offense, from wearing the wrong colour socks in uniform to attempted murder. Many countries have similar snares in their legal systems. The charges were laid by the NIS following an investigation that began 26 months earlier, in November 2015. Senior officials were quick to note that they've taken pains to ensure the investigation was done independently and impartially, under their responsibilities as police officers and peace officers. At worst, the potential sentences he could receive can range from imprisonment for three years to dismissal with disgrace from the Armed Forces. The NIS, the Canadian military’s criminal investigation service of the Military Police branch, is authorized to lay charges independently, normally on advice of a prosecutor of the Director of Military Prosecutions (DMP). The process can only lead to a court martial when, and if, the DMP determines there is enough evidence to proceed, according to standards used across Canada by civil prosecution services. As exceptional as this situation is, there remain many steps that could still take place between now and a potential court martial. Indeed, if the charges do lead to prosecution, the National Defence Act would require that Colonel Dutil be tried by a court martial. One difficulty for the JAG branch arises because of the small size of the military judiciary. Prosecutors appear before those military judges on a regular basis. This could be seen as inappropriate and possibly unfair, and could create the perception of partiality or unfairness for the same prosecutors then are now assigned to prosecute the chief military judge, or any military judge. The DMP can appoint a special prosecutor in specific situations, such as this, by reaching out to another prosecution service to find an impartial prosecutor to consider the charges against a military judge. Another possibility for a special prosecutor could be a military officer (regular or reservist) outside of the Office of the JAG, who is a barrister or advocate with standing at the bar of a province and who has never appeared before a military judge. In discharging their responsibilities, military judges are independent from any military chains of command. They cannot be removed or suspended from command or from the performance of their duties, unlike many other members of the Canadian Forces. The National Defence Act stipulates that military judges can only be removed from office by the Governor in Council “for cause” following recommendations by the Military Judges Inquiry Committee (MJIC). This protects the judiciary and the judicial independence from interference. The MJIC, similar to the Canadian Judicial Council, is independent of the Department of National Defence and the Canadian Armed Forces, and is composed of three civilian judges. The Honourable Richard Bell, Chief Justice of the Court Martial Appeal Court would appoint a chair for the MJIC and convene the committee, comprising two other judges, to look into the judicial conduct of a military judge. The Court Martial Appeal Court has a list of approximately 60 civilian judges of the Federal Court, the Federal Court of Appeal, and provincial superior courts. While Colonel Dutil is not currently scheduled to hear any cases, and he has already delegated his responsibilities to others, he remains the Chief Military Judge and can be removed only by the Governor in Council following recommendation of an MJIC. The senior staffs of the Department of National Defence and the Canadian Armed Forces cannot remove a military judge. This creates another serious challenge for the Canadian military justice system. Everyone accused of wrongdoing has the right to an independent and impartial tribunal. As Chief Military Judge, Col Dutil has three subordinate judges sitting on the military bench within his chain of command. Accordingly, if the remaining judges find themselves in a difficult position because of their relation to the accused, they can recuse themselves. To proceed, she or he would hear the case of a person who was their previous boss – thus potentially calling into question the impartiality of the presiding judge and raising the spectre of conflict of interest. One of the avenues open for the government would be to name a new judge who would not have had previous employment experience with the current Chief Military Judge. The National Defence Act requires that applicants must be a military officer (regular or reserve) for a minimum of 10 years as well as being a member of a law society for at least 10 years. Their names would be entered into the selection pool for assessment by the Military Judges Selection Committee, which looks at the candidacy and ensures that they are suitable to be appointed as judges. Hypothetically, a military judge could be an officer from any element of the reserve force. A soldier, sailor or aviator who meets these criteria could be eligible to apply to the Military Judges Selection Committee for admission to the military bench, as stipulated in the NDA. It is important to note that this Selection Committee operates independently of the Canadian Armed Forces. Gordon Hewart, appointed Britain’s Lord Chief Justice in 1922, observed that “Justice should not only be done, but should manifestly and undoubtedly be seen to be done.” This dictum compels all jurists, civilian and military alike, to ensure that there is absolutely no room for question in their impartial adjudication of cases and administration of justice. Hewart’s philosophy could potentially call into question the legitimacy of all Canadian military disciplinary tribunals. If the National Defence Act’s Code of Service Discipline cannot effectively adjudicate the allegations of wrongdoing by its chief military judge, then the military bench is unable to apply military law equally to all those accused under its provisions. This seemingly confusing situation could be resolved before a court martial is convened for Col Dutil, or it could be the very first of the legal issues addressed by the court martial, if the DMP prefers charges. Conversely, a decision to not convene a court martial resulting from these considerations may raise questions about the legal branch’s working philosophy that no one is above the law. As unprecedented and unforeseen as it is, this situation may provide the impetus for Canada’s lawmakers to pause and contemplate the impact of having the Judge Advocate General as a single military organization – subsuming all of the legal functions of the Department of National Defence and the Canadian Armed Forces, and providing the personnel for the military’s judicial bench. It must be kept in mind, however, that once appointed, a military judge is independent from all military chains of command and all functional command and control relationships are severed, including the Office of the JAG. In 1948, Britain’s secretary of defence separated the “judge advocate” from the “advocate general” and made the military’s judicial bench a component of Britain’s court services, making the JAG a civilian judicial officer of the High Court with a staff of civilian judge advocates. Subsequent trials of military members were presided by a civilian judicial officer independent from the chain of command. Unlike his Canadian counterpart, the British JAG is a civilian judge performing a judicial and adjudicative function. His position is in stark contrast to the Canadian system. The British government also recognized that a military legal officer may not be as independent and attentive to the values of British society when prosecuting military personnel. Consequently, the director of military prosecution was civilianized and moved to the U.K. Attorney General office. There are no military lawyers to defend an accused military member of the British armed forces. Military personnel tried by court martial must hire their own lawyers. If acquitted, the defence department will reimburse legal costs to a certain level. This puts a military person accused of committing a crime on the same footing as any member of the civil society. Currently, a Canadian military member undergoing a court martial has greater access to legal support and representation, and is provided legal defence counsel by JAG’s Director of Defence Counsel Services without charge. In several cases, these personnel appealed their convictions to the Supreme Court (the legal costs of which are out of reach for the average Canadian). Although the current system has been considered constitutionally valid in terms of independence, Canada’s adoption of measures similar to Britain’s would provide greater assurance that people sitting as judges in courts martial are independent, trained and experienced, and will apply the same legal standards to military personnel as to Canadian civilians. They would receive the same instruction and training available to judges in comparable civilian courts, and would be accountable to the Canadian Judicial Council rather than the Minister of National Defence – a political, partisan and elected individual. While JAG has been assigned responsibility to superintend the administration of military justice, it is time that Justice Minister Wilson-Raybould re-read her statement of responsibilities and understand that she is responsible for “the superintendence of all matters connected with the administration of justice in Canada, not within the jurisdiction of the governments of the provinces” and, as a first step, separate the judge from the advocate general. It is time that Defence Minister Harjit Singh Sajjan speak with his government colleagues about assigning the Standing Committee on Justice and Human Rights to undertake another comprehensive independent review of the National Defence Act’s Code of Service Discipline to align it with contemporary Canadian values. It is time that the Senate committee on legal and constitutional affairs examine the Canadian military’s disciplinary tribunal system to ensure it conforms to the spirit of 21st century Canadian values and expectations of justice and fair treatment. Tim Dunne is FrontLine’s Atlantic Canada Correspondent. He is based in Nova Scotia.